Jacqueline Estrada: "Help when I needed it most"
Save the Date for our 2019 Imagine Gala - April 6th! 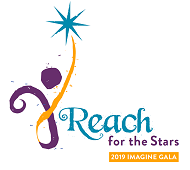 Opportunity Junction's 2019 Imagine Gala will be held on Saturday, April 6th at the Diablo Country Club. Save the date! For 18 years, the lives of low-income families across East Contra Costa County have been transformed thanks to the generosity of our many donors, sponsors, employers, and volunteers. It will be a night to remember. 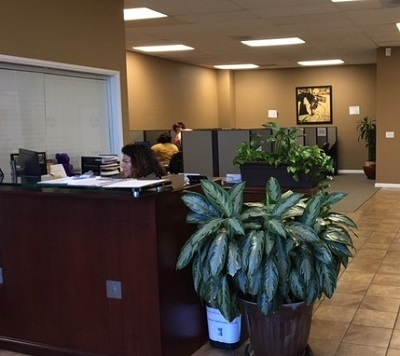 When Jacqueline Estrada walked through the doors at Opportunity Junction in September of 2011, unemployment in Antioch was still at a near record high. Jacqueline, who had held clerical positions in medical offices in the past, had been unemployed for two years. She was desperate and feared the gap in employment would keep her permanently unemployed. She began the process of applying for admission to the Job Training and Placement Program (JTPP). Ten days later, one of her many employment applications landed her a temporary position in Oakland as an office associate, and she took it. "I needed to work," she recalls, "and even a temporary position was worth it." She couldn't do both, so Jacqueline opted out of Class 36 of the JTPP. She completed the temp position in October, then searched for three weeks before landing another one-month gig in November and December. When the January application sessions for Class 37 rolled around, Jacqueline was determined. "She has a strong handshake," one staff member noted at the time. But underneath, Jacqueline's confidence had been shaken. The life skills classes, where she could relate to classmates who had also joined the ranks of the long-term unemployed, built her confidence and rekindled her hope. Meanwhile, she honed and updated her computer skills. 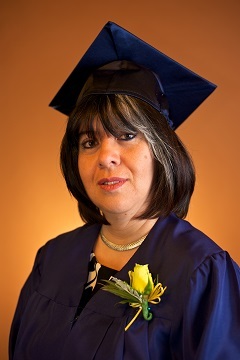 After graduating from training, Jacqueline was assigned to complete her internship at the International Institute in Antioch. "I appreciated doing work for an organization that was making a difference," she remembers, "though I was hoping to get back to the medical field soon." And return to medical she did. Jacqueline has been at Children's Hospital in Oakland since June of 2012, with only a brief interruption in service between when her first temporary position there ended in November and when the hospital hired her on directly in February of 2013. She has worked with Opportunity Junction's Alumni Program Manager to earn several raises and two promotions. She is now an Admitting Specialist earning a wage that makes her officially "self-sufficient." "Opportunity Junction gave me skills, confidence, and hope. 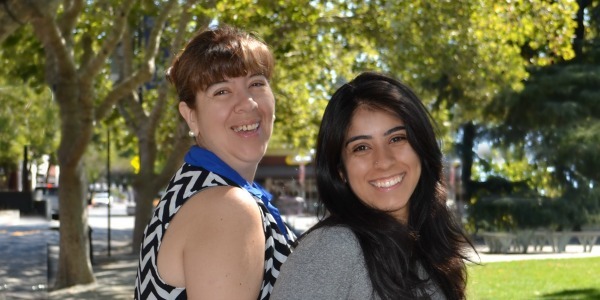 And the staff stuck with me as I worked to earn a raise and a promotion," Jacqueline says. "I went from needing financial support from my family in order to survive to the point where I am a proud mother and contributor. I am grateful that Opportunity Junction was there to help when I needed it most." Happy New Year! Or should I say: Happy New Fiscal Year! For financial reporting, organizational planning, and program outcomes, we run on a July 1 through June 30 fiscal year. And this has been an eventful and productive fiscal year. We served more local residents than ever before (1,124 unique across all programs), placed 98 into initial employment (140 if you include alumni re-placed or supported in earning a raise), and racked up an 18-month retention rate of 81%. Thank you for making our success (and our job seekers' success) possible! And there was much more going on behind the scenes. LEASE EXTENSION: As the year began, much of my focus was directed toward the upcoming expiration of our lease in January of 2019. Should we negotiate an extension with the landlord, or should we try to buy an office building? Either way, we had run out of private offices and needed to add capacity. METRICS AND EVALUATION: As you may recall from last year, we were the first workforce development organization in California to view the aggregate long-term success of our alumni through the lens of Employment Development Department (EDD) Wage Data. Many others have followed suit since then. This year, we launched a project - in partnership with Tipping Point Community, JVS (Jewish Vocational Service), the EDD Labor Market Information Department (LMID), and the Bay Area Workforce Funders Collaborative - to extract yet more meaning from that data. Guided by Nancy Latham of Learning for Action, we will be submitting demographic, barrier, and participation variables to the LMID team to assess long-term impact for several different sub-groups of alumni. Meanwhile, our Director of Programs, Brianna Robinson, and I took a close look at those variables by reference to our in-house retention data. We searched for correlations between 18-month continuous employment and demographics, barriers, participation levels, and short-term outcomes. We uncovered two major findings. First, retention improves for job training alumni the longer they spend in the internship component of the program (before leaving for unsubsidized employment). Second, retention is significantly lower (about 1/3 lower) for alumni who are in recovery from substance addiction. We hope to use this data to improve long-term retention by discouraging early internship exits and by helping alumni in recovery develop sobriety support plans. Finally, we once again teamed up with Tipping Point Community to try out an Impact Audit evaluation conducted by New York's Impact Matters. The evaluations of the Job Training and Placement Program and of Career Counseling and Placement Assistance at SparkPoint aren't quite ready for publication, but recommendations we will be implementing this year include hiring a new staff data manager (title: Learning and Impact Manager), more formally surveying our employer partners' satisfaction and feedback, and systematically surveying Career Counseling and Placement Assistance clients for their satisfaction (as we do for participants in the Job Training and Placement Program). ROAD MAP TO COLLEGE: Our newest program, helping high-need 18- to 24-year-olds succeed at Los Medanos College - underwent a makeover this year. The Road Map team visited half a dozen other youth-serving organizations to learn how to improve their outreach, program, and outcomes. While the focus of these organizations varied, we learned important lessons about education and employment programs for youth. First, we learned that the most successful job training programs for youth combine intensive cohort-based training, support services, and paid work experience. (Sound familiar? Youth who enroll in our Job Training and Placement Program do very well.) Second, we realized that our plans to limit Road Map to those youth choosing Career Technical Education (CTE) tracks was not viable. There remains significant stigma attached to vocational education and career paths that do not require a four-year college degree. This year, Road Map is changing its model from supporting youth in completing CTE certificates at Los Medanos. Instead, we will be focused on helping high-need youth enrolled in any program (including A.A. degree programs and programs to transfer into 4-year institutions) to securely attach to the college. We won't be able to support them for the 4-6 years it may take to complete that education, but we hope to nurture a strong relationship that will bring them back "home" to us when it is time for job placement. AMERICA'S JOB CENTERS OF CALIFORNIA (AJCC): This year, we joined with other non-profits, with the Adult Education centers, and with the Contra Costa Community College Consortium to form the Contra Costa Workforce Collaborative. We did this in response to news that the county Workforce Development Board was going to bid out the work of running Contra Costa's AJCC's. By leveraging the physical locations of the CCWC partners, the new model will provide many Access Points, including one at Opportunity Junction! 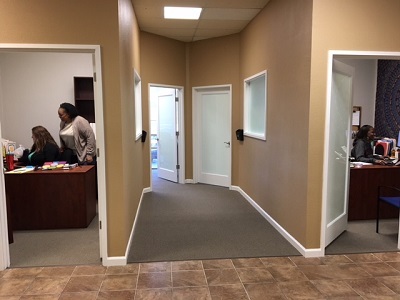 We're excited to be involved in this partnership, to be expanding our public hours to provide basic career services, and to be providing individualized career counseling and placement in our Antioch office (as well as at SparkPoint Contra Costa in Bay Point). The Board of Supervisors will vote on approval of the new contract on August 8, 2018. SABBATICAL: At the time that new contract is voted on, though, I will be on the East Coast. Our Board of Directors has awarded me an 8-week sabbatical that I will be taking July 30 through September 21 of this year! The Board's objective, in line with current trends for keeping valued executives motivated and refreshed in the nonprofit sector, is to reward me for the outstanding job they feel have done recently and in past years. The sabbatical will give me the opportunity to rest and then return to my work with a fresh perspective. I won't be checking email or having any contact with the organization during my absence. Instead, I'll be spending time with my parents, attending a songwriting retreat, taking a vacation to Hawaii, hiking around the extended Bay Area, and tackling a pile of books that I've been wanting to read. We have a strong leadership team in place to support the organization during my absence. Staff leaders include director of programs Brianna Robinson, director of administration Melinda Johnson, development manager Eva Luo, and grant writer Cynthia Dial. Discussions and planning have taken place with both Board and staff to prepare for my time away. Brianna Robinson will have the opportunity to serve as our Acting Executive Director during that time. 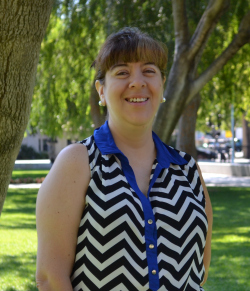 Brianna has been with Opportunity Junction for more than 11 years, taking on progressively more responsibility. She has been my key leader on a number of important strategic initiatives. While I'm gone, we'll be able to test out our succession planning. And when I return, she may keep some of the responsibilities she assumed during my absence. Regardless, the organization will be stronger and more sustainable as a result. I look forward to checking back in with you when I return from summer vacation. In the meantime, know that you have my gratitude for your hard work, generosity, and commitment to our community. We have a tradition in our office: when the gold bell rings, the celebrations begin! 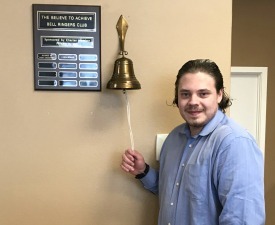 Ringing the bell is a highlight for our interns because it signifies the culmination of weeks of training and hard work that resulted in a new job. All staff, interns, and trainees stop what they are doing and gather around the bell to cheer on the intern. It is a proud moment for the staff and often an emotional moment for the interns. Since 2014, Opportunity Junction has participated in a pay-for-performance challenge proposed by an inspired donor and charter club member, Aaron Silva, President and CEO of Paladin fs. Members of the Bell Ringers Club make quarterly donations based on the achievement of meaningful outcomes: placement into employment. The placement is the culmination of months of full-time training, paid work experience, and career skills development. It represents success to our trainees and a quantum jump in their ability to support their families. 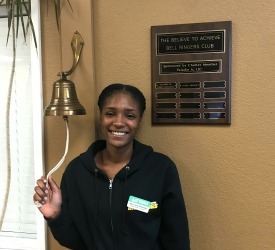 Each time a Job Training and Placement Program participant accepts an offer for their first post-program job, they ring the bell that hangs in our reception area. When that happens, Paladin fs, the Alliance of Chief Executives, and an anonymous donor ("A Well-Wisher" on the Bell Ringers Club plaque) together donate $350 to support the program. Be part of our participants' success by committing to a donation for every job secured. Members of the Bell Ringers Club have made each placement of a job training participant even sweeter for us. 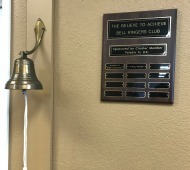 Thank you to the Bell Ringers Club members Paladin fs, Alliance of Chief Executives, Teri House, and an anonymous well-wisher for giving us a challenge we plan to continue to meet. "The bathrooms are out of order...again." This phrase, repeated at least monthly (and sometimes weekly!) 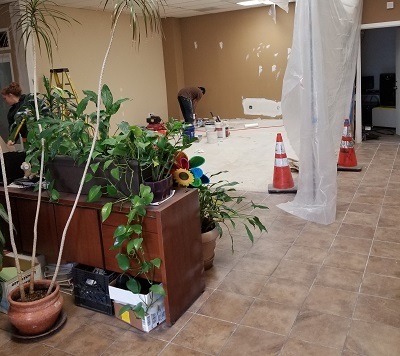 around the Opportunity Junction office, was the unexpected beginning of an office renovation journey that began a little over a year ago in May 2017. We were at capacity for our current office space and we had no room for staff or program expansion…and then there was the ever-present problematic plumbing. So when our lease came up for renewal, we went looking for a building in Antioch that we could lease or even perhaps buy when our current lease expired. However, there were no buildings in Antioch that we could envision being the new home of Opportunity Junction so we turned to our current landlords and began the lease negotiation process to stay in our current space. But what about the lack of space and the plumbing issues? 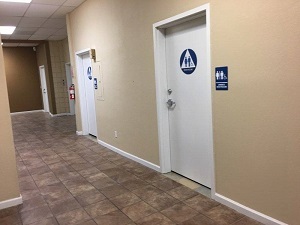 Fortunately for us, we were able to utilize pro-bono architectural services from Fog Studio to design four new ADA-compliant, gender-neutral restrooms to replace the current ones and to design a complete renovation of part of the office that allowed for additional private offices for current and future staff. 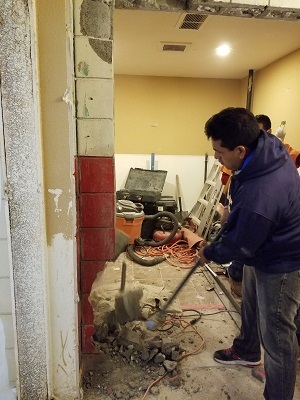 We were granted a Contra Costa County Community Development Block Grant for the bathroom renovation that, in conjunction with Tenant Improvement funds from our landlords, Peterson Properties, completely paid for the cost of phase one of our renovation. 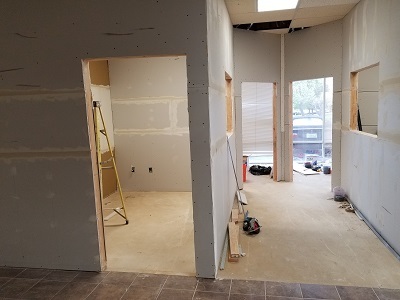 Phase two, the more complex office renovation, started in the beginning of March 2018. Additional Tenant Improvement funds from our landlord were combined with part of a very generous grant from the Dean and Margaret Lesher Foundation to pay for phase two of the renovation. Once again, Grace Construction worked tirelessly to complete the office renovations ahead of schedule. Two weeks after demolition began, our Intern work floor had been relocated to directly opposite the front doors and we had four new private offices built where the work floor had been. The new office space seamlessly blends with the old space and looks like it was always there. While we had the walls open, we took the opportunity to fix some other facilities issues as well, such as missing HVAC venting in some offices and phone/network wiring in our conference room. The end result is a better functioning space that can hold more people. Staff and participants alike are thrilled with the results of our office renovations! If you haven't been by recently, stop in and get a quick tour of our new space. We guarantee you'll be impressed. 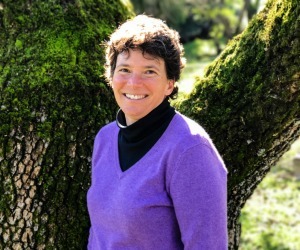 The Anonymous Fund at the East Bay Community Foundation: The Anonymous Fund at the East Bay Community Foundation issued a grant of valuable core operating support. While we allocate most unrestricted funds to program support, core operating support also enables us to maintain a strong infrastructure (technology, finance) and to pilot promising new initiatives. 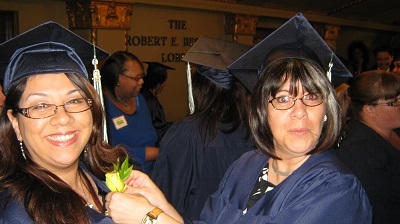 Antioch Community Foundation: The Antioch Community Foundation renewed its support for the Job Training and Placement Program, awarding a grant to support the meaningful graduation events that publicly celebrate the success of our participants. Their support will fund three graduations during the year. California Wellness Foundation: The California Wellness Foundation awarded a prestigious three-year grant for core operating support. The foundation, among other priorities, seeks to improve health outcomes by strengthening pathways to obtaining and retaining employment. Lowell Berry Foundation: The foundation renewed its long-time commitment to support the Job Training and Placement Program. The foundation is committed to, "serving our local community by providing a safety net for those in need while focusing on organizations that effectively shape lives and build leaders for tomorrow." Tipping Point Community: Tipping Point Community has awarded us a grant to improve our technology infrastructure in several respects and reduce the need for continuing upgrades. 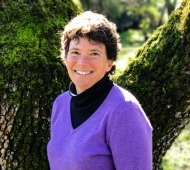 Among other things, the grant will pay for our file serving to move to the cloud, allowing our staff to work from any location - SparkPoint Contra Costa, Los Medanos College - without the need for a VPN. Walter S. Johnson Foundation: The Walter S. Johnson Foundation made the second payment on a two-year grant to support Road Map to College, serving low-income, vulnerable 18-24 year olds enrolling at Los Medanos College. The foundation assists vulnerable youth to become successful adults by promoting positive change to the policies and systems that serve them and supporting high impact and promising practices.